The Interplanetary War, or Interplanetary Wars, involved a period of armed conflict waged throughout the Sol system between 2164 and 2170. It was fought among the United Nations; the neo-communist Koslovics, led by Vladimir Koslov; the fascist Frieden, backed by corporations of the Unified German Republic; and a number of other national governments. 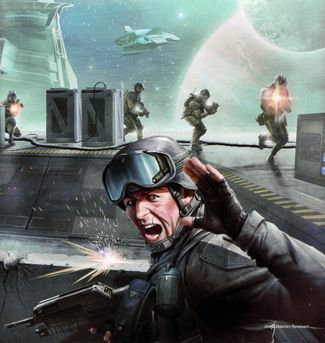 The fighting was the culmination of four prior years of war which included the Jovian Moons Campaign, the Rainforest Wars, and the Mars Campaign. Together with the Interplanetary War proper, these conflicts are sometimes collectively referred to as the Interplanetary Wars. In the twentieth century humans finally escaped Earth's atmosphere once again to ascend into the inky depths of space. The first modern human traveled to the lower reaches of Earth's orbit in 1961 and then in 1969 humans set foot on Luna for the first time in millennia. Other bodies in the Sol system followed throughout the twenty-first and twenty-second century. By 2080 Earth's nations had put together joint efforts to colonize Luna, Mars, and a handful of other sites in the system, including various asteroids. Despite the daunting technological challenge of embedding sustainable populations on these worlds, new scientific innovations eventually made it a reality, and the interplanetary colonies saw growth and prosperity during these early years. Global wars on Earth shattered the power of old nation-states even as virulent new philosophies spread among the solar colonies. Not everyone embraced relative peace under the aegis of the United Nations, and new factions with militant ideologies exacerbated political and economic fracture lines to the breaking point. In the mid-twenty-second century, two militant movements emerged among Earth's colonies, dramatically altering the political landscape. The emergence of both was due in part to overpopulation and unrest on Earth itself. Those belonging to the first, originating in Mars' mining city of Oenotria, were known as the Koslovics. They were named for the miner-turned activist Vladmir Koslov and his family. The neo-communist Koslovic miners railed against what they saw as their financial exploitation by the corporations which dominated the colony. They looked back on the Soviet Union of the twentieth century with nostalgia and romanticized state control over industry, seeking the elimination of corporate and capitalist influence from societal structures. After the violent takeover of three major mining facilities, the Koslovics were deemed terrorists by the United Nations. Their ideas, however, gained momentum across Mars and rural parts of Luna among people who felt government-sponsored companies were violating colonists' rights. Though the Koslovics did have some supporters on Earth, they operated primarily on orbital facilities, the aforementioned colonies, and parts of the Jovian system. The other hostile ideology, embodied by the Frieden movement, grew out of the major city Katreus on Europa and received backing from a group of corporate interests in the Unified German Republic which had become frequent targets of Koslovic 'workers' crusades'. Though 'frieden' is German for 'peace', the neo-fascist Friedens formed largely in response to Koslovic elements in the Jovian colonies and quickly turned to violence. In 2158 Friedens targeted a United Nations embassy in the Europan city of Thynia and leveled the structure with military-grade explosives. As with the Koslovics, the United Nations branded them terrorists as well, and then also dispatched UN colonial advisors to Io, another Jovian moon. There the UN advisors were tasked with helping to organize police efforts. In the years that followed few colonists remained neutral and both militant groups grew rapidly in support and resources. The United Nations lacked the military capability to prevent this, so the Koslovics and Friedens spread their influence and activities largely unchecked across Luna, Mars, and the Jovian moons. Eventually, the opposing politics of both led to a clash between the two. In March 2160 Frieden secessionists attacked the UN's colonial advisors on Io, which triggered three months of fighting between Jovian-based Frieden and United Nations forces. For these Friedens, it was believed peace could only be achieved through eliminating the 'oppressors on 'Terra Firma'. By this time terrorism campaigns orchestrated by the Friedens and Koslovics against one another had also escalated to full-scale war efforts. The battles which defined the three months in which the Friedens fought both the UN and their Koslovic rivals would come to be known as the Jovian Moon Campaigns. These clashes, the bloodiest humanity had witnessed in decades, foreshadowed the devastation of the Interplanetary War. The Jovian Moon Campaigns served to strengthen the anti-government and anti-corporate sentiments growing among colonists, while also spurring the further militarization of Earth's nations. The distributed nature of these countries' military efforts at this time generally led to disorder in their ranks. In addition, the escalation in tensions created by the Jovian Moon Campaigns led to proxy wars between extraterrestrial colonies sponsored by different Earth governments and even a few armed conflicts between nations on Earth itself. The death toll of the Jovian Moon Campaigns was substantial, but by late 2161 the fighting between Koslovics and Friedens had subsided. Bloodshed ceased for several months, and some speculated that the worst had passed. In February 2162, however, a series of bombings in South America began a nineteen-month series of ideologically-motivated guerrilla conflicts between Koslovics, Friedens, and United Nations forces that would come to be known as the Rainforest Wars. Guerrilla engagements spread across the entire continent and elsewhere on Earth, reigniting violence against military and non-military targets throughout the Sol system. Near the end of the nineteen-month period neo-Friedenists turned against hardliner Friedens in Delambre on Luna as forces of the newly-formed United Nations composite military force comprised primarily of Navy and Marine Corps assets approached. Though the neo-Friedenists were just as opposed to UN control as the rest, there they tried to negotiate a surrender which would leave them with some remaining power. The destruction and famine bred by the Rainforest Wars were still threatening to destabilize Earth's economy after the Interplanetary Wars' conclusion. They also led to some of the most famous literature of the twenty-second century, including Jeremiah Mendez's 2164 military classic, A Soldier's Tale: Rainforest Wars, which remained popular well into the twenty-sixth century. A battle during the war. In November 2163 the Friedens suffered a critical loss, as their leader, Nadja Mielke, was assassinated on her way to a command center in the Europan city of Pelagon. This enraged the Friedens, and in December they retaliated with nearly all the military assets at their disposal. A large-scale campaign against Argyre Planitia, the hub of Koslovic activity (thanks largely to its shipbuilding plants) on Mars, obliterated the city within hours. More fighting occurred during the weeks that followed, as Koslovics scattered into the city's outskirts. By January 2164 the conflicts historically known as the Interplanetary Wars had officially begun. The aforementioned composite UN force, which would later be called the United Nations Space Command, was deployed to the Martian territories' most combat-intensive area in July. The resulting battle on Mars lasted two full years as the United Nations bombed Koslovic remnants, stamping out any Martian opposition. This sorties of this campaign not only made it the first successful UN strike against Koslovic forces, but were also the first extraterrestrial deployments of UNSC marines as well. Thanks to the marines' success, actions that favored large contingents for ground assaults and ship-boarding maneuvers became part of the UN forces' standard strategy from that point onward. Despite the vast death toll, there was little concern on Earth about the ethics of the strikes; most felt that they were justified as a way to prevent the violence from spreading to their own soil. Recruitment drives and propaganda tactics strongly bolstered the UNSC during this time. The Interplanetary War was in many ways the culmination of a pattern of massive buildups exhibited by UN-sponsored military forces which had preceded it. Although the Koslovics suffered extensive losses in the early parts of Martian assault, they continued to thrive on Luna and at isolated points on Earth. In August 2167, however, Vladimir Koslov and his family were killed in a bombing near Lake Autolycus on Luna. While the UNSC denied involvement, many believed that the Friedens were not capable of carrying out such an attack. Whatever the cause, this act severed the head of the Koslovic movement. Despite some difficulty on the UNSC's part, Europa, Io, Ganymede, and Callisto all saw large-scale invasions by the UNSC Marine Corps, resulting in the destruction of hundreds of Frieden bases and weapon caches. The last of the Friedens fought savagely under Oscar Bauer, nephew of Nadja Mielke, but by mid-2169 little remained of their movement. 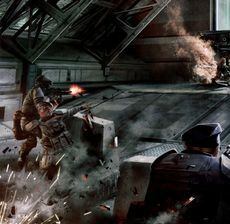 The UNSC defeated Koslovic and Frieden forces on Earth and then methodically eradicated their remnants throughout the system in a series of brushfire conflicts. Before long, the vast vestiges of both were apprehended by the UNSC. The United Nations penned the Callisto Treaty, a ceasefire agreement borne out of fear and simple practicality that gave the UNSC complete military and police jurisdiction in all colonial territories. The treaty was signed by representatives of all three factions in March 2170 on the Jovian moon of Callisto. Basing its core ethos on a strategy that hearkened back to the United States of America, the technocrats in the UN used its increased power to effectively take charge of Earth's remaining national governments. The UNSC became the single organizing independent force in control of the combined military hierarchy of humanity. With this, a single authority came into existence, called the Unified Earth Government (UEG). This would be the seat of power and governance for all of Earth's colonies henceforth. The Unified Earth Government was constituted as humanity's governing body by the UN in the immediate wake of the conflicts in 2170. After the war the UNSC were forced to deal with a less obvious but equally serious threat: overpopulation and a massive military that has no enemy to fight. The post-war period saw massive population surges that, coupled with the destruction and famine bred by the Rain Forest Wars, threatened to destabilize the interplanetary economy. Humanity would not be able to expand beyond the confines of the Solar System until nearly two centuries later, with the discovery of slipspace travel in 2291 and the subsequent formation of the first Inner Colonies in 2362. Through interstellar colonization humanity would enter a new golden age, with its massive population stabilized across many off-system worlds and goods transported to Earth from the colonies. The war saw the first military applications of bioaugmentation protocols, already used outside the military to adapt humans to the conditions of space and different colonial habitats. These augmentations would serve as an early precursor to the enhancements used in the ORION Project and the subsequent SPARTAN programs. January: The Interplanetary War officially begins. July: Navy and Marines assets are deployed by the nascent UNSC to Mars. The Mars Campaign concludes after two full years and ends with the eradication of all Martian Koslovic opposition. August: Vladimir Koslov and his family are killed in a bombing near Lake Autolycus on Luna. The last remaining Jovian Friedens are defeated and little remains of their movement by mid-2169. March: The Callisto Treaty is signed. This conflict was never given a proper name prior to the release of the Halo Encyclopedia. Instead, it was referred to simply as "the first real interplanetary war" in both the pre-release Halo: Combat Evolved timeline and the mirrored version on the Halo Wars official website. The title is capitalized as a section heading on the Halo Wars version, though the same is true of the rest of the timeline. Similar to the United Rebel Front, the use of "Interplanetary War" as an official name likely stems from Halopedia, as this wiki once capitalized all article titles as if they were proper nouns.